The parents of a one-day-old girl who died from an infection contracted during birth want mothers to know they can be tested for the bug. 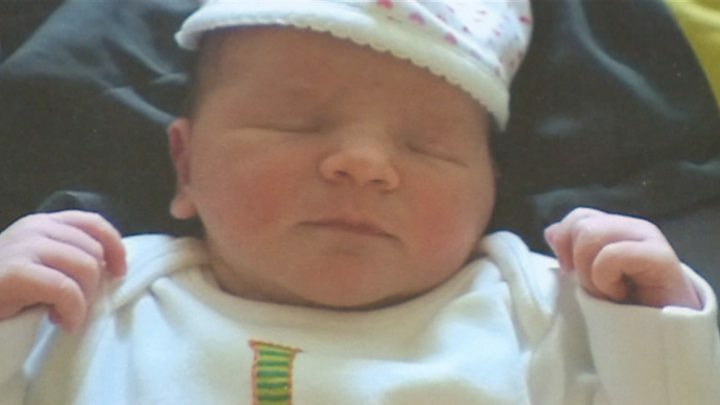 Pippa Griffiths died of a Group B Strep (GBS) infection - the biggest cause of meningitis in newborns. She had been born at home in Shropshire, but was airlifted to Royal Shrewsbury Hospital to be treated by a specialist crew from Birmingham. Pippa's parents want mothers to have the information to choose to be tested. One in five women carry the bacteria but there is no clinical evidence to support routine NHS testing, according to the UK National Screening Committee. Kayleigh Griffiths said she did not know about the infection or how mothers could be tested for it before her daughter was born. "I'd like for other pregnant women to be made aware of it and the dangers it poses," she said. "You never think something like this will happen to you." Group B Streptococcus is a bacteria present in the gut of about 20% of men and women. 1 in 2,000 babies contract an infection when the bacteria is passed onto them during birth. Group B Strep can cause meningitis, septicaemia and pneumonia in newborn babies. One baby a week dies and one baby a fortnight suffers long-term disabilities. Jane Plumb from Sussex who founded charity Group B Strep Support with her husband Robert when they lost Theo at just 17 hours old due to a GBS infection. She said: "These lovely mums and their babies show all too clearly what GBS infection in babies can do. "It's unforgiveable that the UK isn't doing more to prevent these largely preventable tragedies. "Raising awareness of GBS is vital if more avoidable infections in newborn babies are to be prevented." Dr Alison Bedford Russell, neonatal consultant at Birmingham Women's NHS Foundation Trust, said women can seek a test by talking to their midwife or pay about £35 to be screened privately. She said mothers should have the choice of screening and antibiotics on the NHS. "I really lament the fact that we see babies with severe infections that can have severely compromising outcomes for an illness that's preventable," she said. Dr Anne Mackie, director of programmes for the UK National Screening Committee said the number of women that would be offered antibiotics if they tested positive would be "very high", which could "expose the mother and baby to unnecessary antibiotic use".